Woo-hoo! 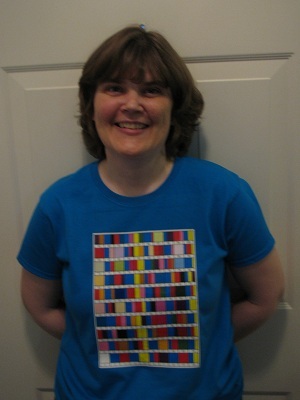 After getting my prototype Prime Factorization t-shirt from my new Cafepress Shop, I tweaked the colors to make the chart brighter. I also made shirts on different colored backgrounds. As luck would have it, the new shade for 2 almost perfectly matches the “Caribbean Blue” background. My new revised shirt came this week, and I love it! For those just coming in on this, the chart is 10 rows of 10, beginning at the bottom left. (Because I can’t bring myself to have higher numbers down lower on the shirt.) Each prime number gets its own color, and the prime factors of each number are displayed by color. Unlike the sweater, the numbers are listed on the shirt. Like the sweater, I couldn’t resist putting rows of 8 on the back. And of course, I had to list those numbers in their Octal representation. 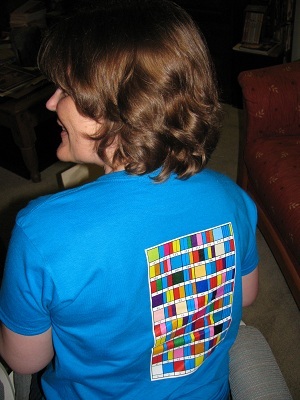 But since that adds to the cost, I’m also offering t-shirts that have only the chart on the front. I am super happy about how the prime factorization scarf is turning out. The original sweater is kind of pointless if you don’t know what it represents, but the scarf is aesthetically pleasing totally aside from the mathematics. This one starts at the bottom. Though with a scarf, you can hold it any direction you like. Once again, the background color, black, represents 1. It’s used between the other numbers. The first stripe of blue is our first prime, 2. Then we have pink for 3. 4 = 2 x 2. 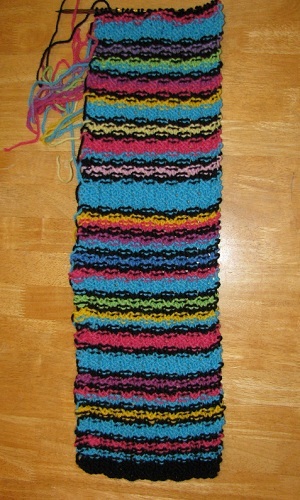 It’s not quite as easy to tell on the scarf, but the next blue stripe is twice as wide as the original. 5 gets a new color, yellow. 6 = 2 x 3, so a stripe with blue, then pink. 8 = 2 x 2 x 2, so that stripe of blue is three times as wide as the original. And so it goes. I love the way the colors flow. You can quickly see that blue is showing up every second stripe, and that every second blue stripe is fatter. You can see the pinks showing up every third stripe and the yellows every fifth. As I said, I think it makes a lovely art object totally apart from the math behind it. And the math makes it completely cool. Also, with a scarf, you don’t have to decide your colors ahead of time. I am using a certain progression. I’m afraid going to 100 is going to be ridiculously long, but I may do it anyway. After all, I’m doing it more for the math than anything else. But when I’m done, I’m planning to make a cuff-to-cuff cardigan using the same design, and that one cannot go so high. I’ll continue to show my progress. Such fun! 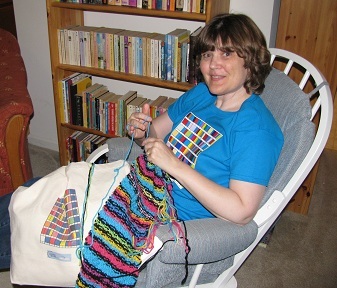 This entry was posted on Friday, May 18th, 2012 at 9:44 pm and is filed under Knitting, Mathematical, Prime Factorization. You can follow any responses to this entry through the RSS 2.0 feed. You can leave a response, or trackback from your own site.